My soon to be four-year-old daughter is very aware of my running practice. My first chunks of time away from her during her early months of life were to run races or go for jogs. She’s met me at finish lines, and spent nights in hotels cuddling me as I slept fitfully before races. I’ve wrangled her stroller and held her hand through crowded expos. Two years ago, when I set my sights on running a full marathon, I nursed her during my many months of training. She’s been stealing my running shoes to shuffle around the house in them since the time she started walking, and she loves to jangle my medals that are hanging on the office wall. She gives me hugs before I leave the house for a run, and she is always the first person I see when I get back. Lately she’s been asking to run with me. She is a powerhouse of determination. When we go for hikes or walks, she charges out ahead of me, running as quickly as she can. 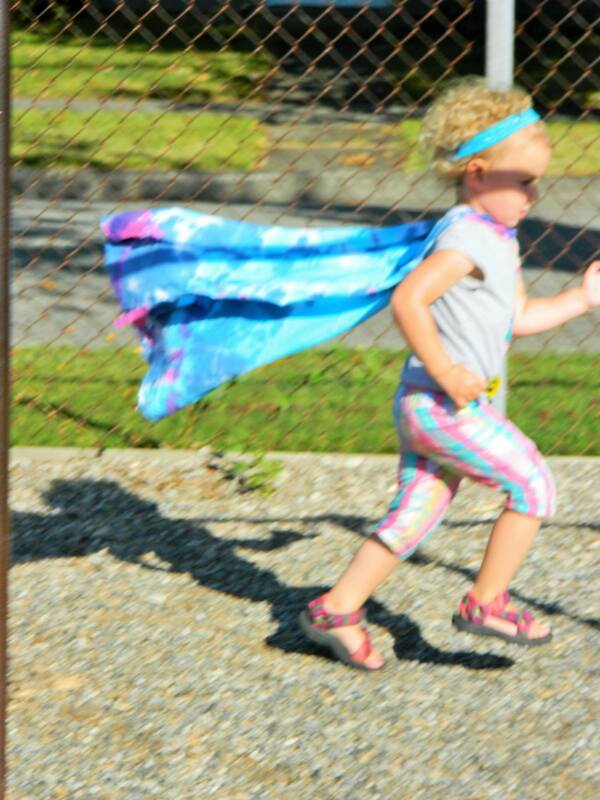 In the backyard, she becomes Wonder Woman, zipping around speedily as she chases bad guys and ” ‘ompels them to tell the truth” with her make believe lasso (my husband is usually her target!). My daughter reminds me that there is freedom in movement. And with that movement, comes joy. She exercises through play. Her mind is completed engaged in the imaginary of the scene she sets out to create. She does not fall victim to the pulls of technology and passivity. Her day is fully invested in exploration, adventure, and experimentation. I’m working out regularly so that I can keep up with my granddaughter! I love her imaginative play…I, too, can be a kid again!